Get moving and improve your insulin sensitivity. I hate to say there’s such thing as a magic bullet for health – but when it comes to managing diabetes, exercise really is magical. Exercise can have a positive impact on your blood glucose levels, which is why I like to think of exercise as a form of medicine you can freely and happily administer to yourself. Believe it or not, exercise is meant to be fun. Just 30 minutes of moderate physical activity and two resistance training sessions each week are recommended to help prevent diabetes-related complications. Resistance training improves your insulin sensitivity by opening the gateway to the muscle cell, so glucose from the bloodstream can freely enter. Repeatedly contracting your muscles under mechanical tension, such as lifting free weights in a gym, allows your body to reap the rewards. 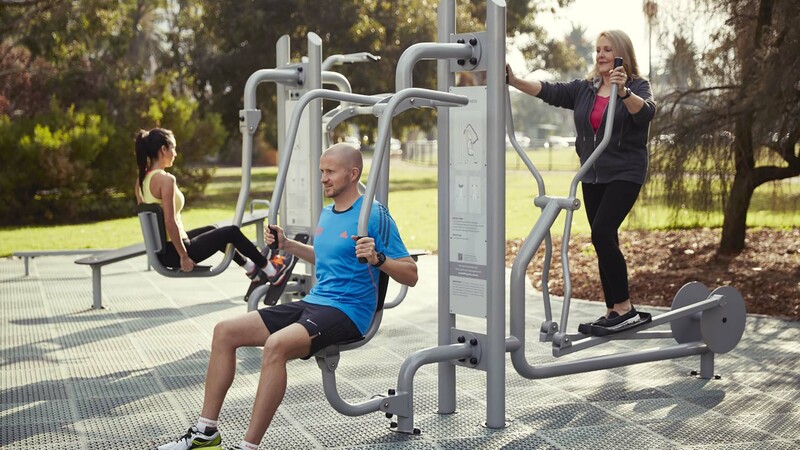 The good news is, you don’t have to buy a gym membership to enjoy these benefits, with councils around Australia installing free outdoor gyms created by a_space. Outdoor gyms are suitable for all fitness levels and if you’re new to exercise or recovering from an injury, consulting with an Accredited Exercise Physiologist can help you begin a program safely. Here are a few tips to get you started strong. If you’re new to resistance training, be assured you don’t have to become a gym junkie. As little as 15 minutes of non-stop exercise is enough to elicit excellent results, so try it out and build from there. If you have previously diagnosed conditions that might stop you from taking part in strenuous physical activity, make sure you speak to your doctor before commencing a program. They can refer you to an Accredited Exercise Physiologist to develop a safe and effective exercise program. If you find yourself at an a_space outdoor gym, you can refer to the easy-to-follow instructions on the equipment, or scan the QR codes with your smartphone to bring up a video demonstrating the exercises. This provides clear instructions for safely using the equipment in a variety of ways. It’s important to start moving in a way that feels right for you. If you have a joint or muscle that hurts, don’t push through it just because the exercise says so. There’s a difference between safely pushing through a healthy pain (like a muscle burn) and pushing through an unsafe pain (like a sharp, shooting pain or aching joint), so get to know your limits. When in doubt, leave it out! Training outdoors is a great opportunity to get your daily dose of sunlight for vitamin D production. When exercising outdoors it’s also important to remember to wear sunscreen, hat and sunglasses, and of course, stay hydrated!